Frederick William Lowe was born in Burton Joyce, Notts in 18752, the second child, only son of Henry and Hannah (née Thurlby) Lowe. Henry worked as a groom in Burton Joyce, early in their marriage but came to live in Beeston in about 1881, with his family. By 1891, they were living at 17 Dagmar Grove, Beeston and Frederick was apprenticed as a brass turner3. By 1901, they had moved to 6 Wood Street, Beeston and Frederick was working at the Humber cycle works4. Later that year, he married Mary Taylor who had been working locally as a domestic servant5. They set up home in Beeston where they had two children - Frank in c1903 and Elsie in c1904. By 1911, the cycle works having closed down, Frederick was working as a hot water engineer, probably with Foster & Pearsons, and living with his family at 4 Church Lane, Beeston6. Although his Army Service Record has not survived, it appears that, although he was then almost 40 years old and married - and therefore outside the target group for volunteers - Frederick enlisted in January 19157 with the Sherwood Foresters and become part of 10th (Service) Battalion which was formed at Derby on 13th September 1914, coming under the command of 51st Brigade in 17th (Northern) Division. After initial training locally, the battalion underwent final training at Wool and West Lulworth Training Camps in Dorset and at Winchester. It had been intended to use the division for Home Defences but this decision was changed and the battalion left for France, landing at Boulogne on the 14th July 1915, as part of 17th Division and moved into the Southern Ypres salient for trench familiarisation before taking over the front lines in that area. However, it appears that Frederick did not join the battalion in France until 1916, almost certainly in time for the great Somme offensive in July, the Battle of Albert, in which the Division captured Fricourt and took part in the Battle of Delville Wood.8. In early April 1917, the battalion moved into the Arras area. During the First Battle of the Scarpe which got underway on the 9th, it was held in readiness for four days, at 50 minutes notice, to follow the cavalry when they broke through the trench system but were, instead, redeployed to take part in another advance - Second Battle of Scarpe. In a confused move to 'Bayonet Trench' the battalion faced very heavy machine gun fire and many were forced to take shelter in shell-holes when part of the trench was found to be occupied by the enemy9. It appears that it was at this time that Lance-Corporal Lowe was killed. 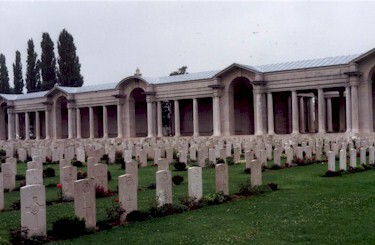 As his body was never identified, Lance Corporal Lowe is remembered on the Arras Memorial, in the Faubourg-d'Amiens Cemetery, Arras, which commemorates almost 35,000 servicemen from the United Kingdom, South Africa and New Zealand who died in the Arras sector between the spring of 1916 and 7 August 1918, and have no known grave10. He was posthumously awarded the Victory Medal and the British Medal11. Frederick's Army financial effects of £3 0s 5d were paid to his widow on 7 November 1917 and she received his War Gratuity of £10 on 20 October 191912. By then she had married railway worker, Albert Mayfield early in 1918 and was living at 2 Windsor Street, Beeston, where they were to live out their lives, both dying in 1947. 2His birth was registered in Basford Registration District (of which Burton Joyce was part) in Q3/1896 (Ref 7b 203). 41901 Census, Piece 3153 Folio 153. 5Mary Taylor was born in Bardney, Lincolnshire in c1878. By 1901, she was working as a domestic cook in the household of Francis & Mary Good at Elm Avenue, Beeston, Notts (1901 Census : Piece 3152 Folio 65). She and Frederick married in Basford Registration District (of which Beeston was part) in Q4 1901 (Ref 7b 418). 61911 Census, Piece 20431 RD429 SD3 ED6 Sched 12. 9This account of the battalion's involvement at the Battles of the Scarpe is based on the Battalion's war diary. 10This description of the Arras Memorial is based on that included in the Commonwealth War Graves Commission website.